Kazuo Oga is one of Studio Ghibli's greatest artists, as the painter who created the wonderful backgrounds for such films as My Neighbor Totoro, Omohide Poro Poro, Porco Rosso, and Princess Mononoke. His artwork is one of the reasons why I treasure my Ghibli Art books so much. There's so much attention to detail, so much love of texture and color. I can't think of another artist who brings the natural world to life. This summer, Oga was featured in a major gallery exhibition at Japan's Museum for Contemporary Art. Over 600 paintings from his career at Ghibli were displayed, offering art and movie lovers to appreciate the master up close. Now this is where Studio Ghibli really earns their status as the world's best film studio. This month saw the release of the documentary DVD, Kazuo Oga Exhibition: Ghibli no Eshokunin - The One Who Painted Totoro's Forest. The gallery experience is brought home for the rest of us, including numerous interviews with Oga's colleagues and and peers. Everything, according to the YesAsia page, is subtitled into English. 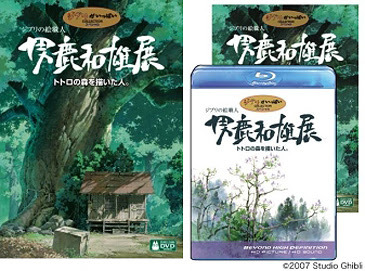 This DVD is being released in standard DVD and Blu-Ray, Ghibli's third release in the BR format. The package includes discs for both formats, which is a great incentive for us to make that jump to hi-def. This is something that I see happening a lot for Japanese movies, and I wish it would be seriously pursued here in the States. Both formats include a 72-minute feature on Oga, and a 40-minute feature containing interviews from Isao Takahata, Ghibli art department head Tanaka Naoya, art director Kobayashi Shichiro, and art scholar Tsuji Nobuo. The standard DVD also includes a 20-minute feature that brings us into Oga's creative realm. This feature is extended to 35 minutes for Blu-Ray, and also shows Oga painting the artwork for the DVD. But the DVD's best feature - and this is where you're really excited if you're a Blu-Ray owner - is the inclusion of all the paintings from the Oga exhibition. That's over 600 works in all. I'm sure this will look great in standard format, but if you're looking for something to really show off that new widescreen tv, well, folks, this is it. You can purchase Kazuo Oga Exhibition seperately in each format, but YesAsia is selling both packages together, and since you're paying the same for the BR alone, you might as well grab both. Now at least you'll have something to show off when you finally break down and get that BR player (or whenever the prices come down to reasonable levels). This is what I'm planning to do. The big question on all our minds, of course, is when Ghibli will begin releasing their feature films on BR. This DVD release will only whet our appetite for more. Disney is pretty heavily committed to Blu-Ray, and the "format wars" are pretty much a non-starter in Japan. So it's really only a matter of time before we get our hi-def Totoro. Oh, and have I mentioned that Blu-Ray players will play Japanese discs on American players? Yep, both countries are included in the same region - and, yes, the suits are still sticking with those stupid region codes. Like every player on the market won't be hacked. Update: I've added a direct link to YesAsia among the purchase links. The current price is just under $55. Enjoy. Just wanted to add that surprisingly the Blu-Ray disc actually is codefree. The information given by Yesasia is wrong. It says "ALL REGION" on the back of the Blu-Ray case and the disc plays back perfectly on my German PlayStation 3 system (Japan/US = Region A, Europe = Region C). Enjoyed the BD yesterday !!! ... Oga seems very nice and friendly :-) and his work is absolutely unbelievable. This man can do something with light and shaddows ... I love this release.